Shortly after it was announced that Google would launch its new brand Alphabet on ABC.xyz, there was a run on alphabet related and .xyz domain names. Judging by a recent Whois change, it looks like Google recently acquired abcdefghijklmnopqrstuvwxyz.com (the full alphabet). As you can see in the screenshot above, the domain name was originally created back in 1999. Whois records show that Google is now the owner of abcdefghijklmnopqrstuvwxyz.com. Prior to the acquisition, the domain name was privately owned and appears to have been parked. At the time of publication, abcdefghijklmnopqrstuvwxyz.com does not resolve, although it would seem wise for the company to forward it to the Alphabet website. Since it was apparently a private sale, I doubt we will know what Google paid to acquire the domain name, although one can assume it cost more to buy after the news of Alphabet was released. I don’t know if this domain name was important for the company to acquire, but it does not seem like they are going to get Alphabet.com from BMW, and it seems pretty unlikely ABC will sell them ABC.com either. I did a random search of other domain names that have parts of the alphabet, and most seem to be registered. I also checked the full alphabet in other extensions, and it looks like many of those are registered as well. Several of the main extensions (like .net, .org, .info…etc.) were registered prior to the Google news about Alphabet. I didn’t notice any that were registered to Google, although I admittedly didn’t spend much time looking. Thank you to Franky T. for sharing. It’s sort of funny. Just a novelty and nothing more. But a conversation piece. And that’s the point! Goal met. Maybe I will get great offers after this announcement. LOL… I presume this was more of a defensive acquisition. 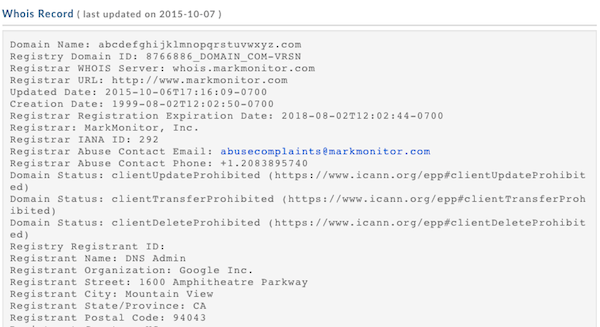 Kinda silly… doesn’t markmonitor make money off each domain they register on behalf of their clients? I guess Google has money to burn. No one in their right mind is going to type that into their browser. Well I’m Mexican and I just buyed abcdefghijklmnopqrstuvwxyz.com.mx for only $10.00 USD, PROBLEMO? I own the domain hack Alphabetic.al, can’t see Google buying it off me any time soon, though.